Tapping into religious teachings about stewardship, environmental activist Bandana Kaur enlists Sikhs around the world to safeguard the environment. Many religious groups have taken on the role of environmental custodians, citing scriptures that urge living in harmony with plants and animals. Representatives of nine world religions pledged in 2009 to develop environmental programs. The Sikh religion’s contribution to that effort is called EcoSikh. With a global community 30 million strong, Sikhism is the world’s fifth largest religion. Sikhs trace their roots to Punjab, a historically fertile region divided between northwestern India and eastern Pakistan. In the 1960s and 1970s, the Green Revolution — research and technology breakthroughs that dramatically increased agricultural yields worldwide — turned Punjab into “the breadbasket of India.” In the past 20 years, though, the intensive farming has eroded Punjab’s soil and water. Bandana Kaur, North American head of EcoSikh. Credit: Courtesy of Karaminder Ghuman. 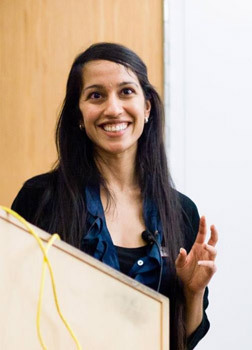 Bandana Kaur became EcoSikh’s North American program manager in 2010 after earning a master’s degree in environmental science from Yale University. For her thesis project, she traveled to Punjab to study the role of women in agriculture. She traces her interest in the environment to her great-grandmother, who told stories to a school-aged Kaur about Punjab’s rich animal and plant diversity before the Green Revolution. Kaur and her team are inspiring Sikhs to take on the challenges of climate change, sustainable urban planning and repairing Punjab’s depleted resources. Kaur spoke about EcoSikh’s projects at the February 2013 meeting of the American Association for the Advancement of Science in Boston. Afterward, she met with Rina Shaikh-Lesko of the University of California, Santa Cruz’s Science Communications Program to chat about planting the seeds of environmental change among Sikhs. Rina Shaikh-Lesko: How did you get interested in environmental issues? 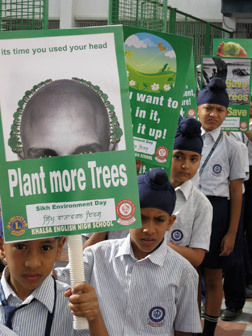 Bandana Kaur:Part of it was environmental education at a young age. The other part was going to Punjab when I was young and seeing, basically, the trees didn’t look like the trees I saw growing up in the United States. The land really looked like it was stripped of a lot of its natural beauty. There weren’t birds. A lot of the wildlife described in the Guru Granth Sahib [Sikh scriptures] isn’t there anymore. Something had really been taken, something had been removed from this land that I felt was such a piece of what [the land] was — in my own understanding, through my family’s knowledge, through the Guru Granth Sahib. That’s when I really started to think, this is the issue I want to work on for the rest of my life. Rina Shaikh-Lesko: And how did you begin working with EcoSikh? Bandana Kaur:In late college, I became really interested in environmental issues. I was also really close with my great-grandmother, who lived with us for most of my life. She used to talk to me a lot about her life in Punjab growing up: the trees, the environment and the birds around her. Through my relationship with her and my own commitment to Sikhism, I saw a lot of synchronicity. I really wanted to find a way to work on environmental issues in Punjab. I specifically went to graduate school for this; I did my field work in Punjab looking at women and biodiversity. EcoSikh was being launched midway through my graduate program. It was kind of serendipitous. It was everything that I wanted to do. I’ve been involved with the Sikh community since I was three or four years old. I’ve always felt like I was raised by my community; the community was essentially extended family, my role models, my caregivers. Rina Shaikh-Lesko: How did the Green Revolution affect Punjab’s environment? Bandana Kaur: This is really the biggest piece of the puzzle. The Green Revolution emphasized high-yield wheat, rice and corn, so that Punjab could be the source of a lot of the food for India. You need more fertilizer, pesticides, and farm machinery and irrigation to cultivate these seeds at the yield that was being procured by central government. In the mid-90s, farmers started seeing a decline in yields, and realized they’d need even more fertilizer or more pesticides. Through this high-input approach, there’s been an erosion of the natural resources of the region. The soil has lost a lot of its main nutrients. The water table has declined in 75 percent of Punjab. Through the wide application of pesticides, [there is a] very high rate of cancers. The questionable impact of the Green Revolution on the natural resources comes into play, into the future of Punjab. Rina Shaikh-Lesko: What options are available for reversing that erosion? Bandana Kaur:You really need a twin approach of sustainable agriculture and sustainable industry. The way that the world market economy is changing, agriculture is not as profitable. There have to be other opportunities that are sustainable as well as profitable. So you have a sustainable farming sector, a sustainable industrial sector, and then a service sector that is not so resource-depleting. Right now, rivers in Punjab are very polluted from industrial waste. Rina Shaikh-Lesko: Sikhs have settled so many different places and they deal with such different environmental challenges. How does that affect the work that EcoSikh does? Bandana Kaur:The major push has been the need and urgency of an environmental vision in Punjab. That’s been the emotional pull for the community. By working in unison wherever Sikhs are, they feel what they’re doing locally ties into that work. By working in the diaspora, in the different countries that we are in, we express our support for Sikhs in other communities that are facing this issue head-on. South Asia is facing climate change, the drying up of rivers, and flooding in a way that’s very extreme. It’s a sensibility the community does have, and we draw upon that. 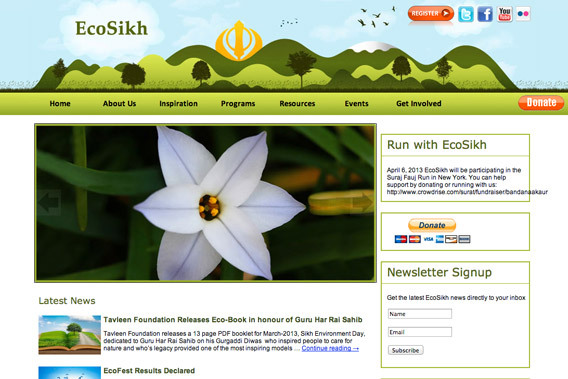 Rina Shaikh-Lesko: One of EcoSikh’s main projects is Sikh Environmental Day, which happens every March 14. How do people celebrate? Bandana Kaur:They pick and choose their own way of celebrating. Local Sikhs make the decision based on the awareness and needs of where they live. In Nankana Sahib — the birthplace of Guru Nanak [Sikhism’s founder], in present-day Pakistan — Sikhs, Muslims and Sufis were working together on restoration projects. 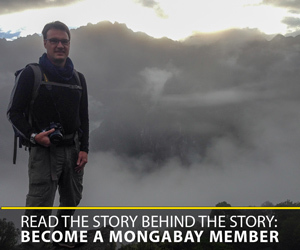 It was bringing people together that transcends our labels of religion. This past year, there was a school in Hariyana that started a tree nursery within their school. There’s this beautiful video of all the students planting their trees around their school. Rina Shaikh-Lesko: As part of Green Amritsar, the effort to make the historic city of Amritsar environmentally sustainable, the kitchen at the Golden Temple has seen some environmental improvements. Why start with the kitchen? Bandana Kaur:The langar [community kitchen] has a huge numbers of visitors each day, around 60,000. On holidays, it’s about 100,000. They have one of the largest facilities where a lot of people are dependent on langar [communal meals] for their food needs. Considering the amount of food that Sikhs are growing, cooking, and serving to people, we also see the potential for langar to serve organic food, which would have a positive impact on our health, our land and the region’s farmers. 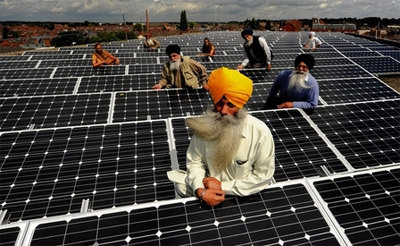 The langar is also a key location for the adoption of renewable energy. Amritsar made a decision last year to install 30 concentrated solar dishes to capture energy from the sun to fuel heat for cooking, replacing about half of the liquid petroleum gas used in the langar with a renewable resource. Rina Shaikh-Lesko: What is the Green Gurdwaras project about? Bandana Kaur:Gurdwaras are spread throughout the Sikh communities, across six continents. Sikhs consider the Gurdwaras as a learning place, where Sikhs connect with the Sikh teachings together. A handful of Gurdwaras have already embraced positive environmental practices. This ranges from some solar gurdwaras in the Subcontinent, in the UK and North America, as well as gurdwaras that are doing organic farming or planting. One gurdwara is composting, and many more are getting rid of disposables. Rina Shaikh-Lesko: How do you think the faith-based approach differs from the approach science has taken until now? Bandana Kaur:Just looking at the numbers can be very daunting: the scale of what’s happening to the planet and whether we have the capacity to meet the challenge. The approach that faith gives to environmental issues — the approach that EcoSikh has worked with — is this idea of celebrating our own resources and our own traditions that connect to the environment. Working through this sense of renewal, the power of lots of people putting effort into one thing at the same time is the inspiration behind our movement. Rina Shaikh-Lesko: What can Sikh elders teach younger generations about stewardship? Bandana Kaur:That’s been one of the most profound parts of this journey for me, to realize how much knowledge there is within my community and the elder generations. They have a lot more knowledge of the native trees of a region. They know much more about the native crops, which are better suited for the soil and water conditions. They talk about the traditional farming practices, and practices that sustained the planet for generations. My great-grandmother used to say one thing a lot: “Kudrat bari beant hai.” That translates directly as “The Creative Force is so limitless,” and it basically means, “Nature is so generous.” That sensitivity is inspiring for our generation. It’s been incredibly powerful for me. I find that in the generation of Sikhs growing up in North America, there’s a fascination with understanding the knowledge of our elders, documenting it, and trying to preserve it and learn from it. Rina Shaikh-Lesko: What’s next for EcoSikh? Bandana Kaur:We’re hoping these projects will have a domino effect. They can be models for others. If we have a Sustainable Amritsar, we can think about other cities in Punjab. If we have strong model gurdwaras, those [can serve] as models for gurdwaras throughout the world. It’s deepening and strengthening the community’s capacity to work on this issue through their own knowledge and documentation. Rina Shaikh-Lesko: What do you think EcoSikh’s capacity is to have a real impact on environmental problems? Bandana Kaur:The Sikh community living outside of Punjab is growing up with a deep sense of what the major problems are in their native land. We’re at a stage where the community is growing in its own ambitions educationally and economically, while still having a sense of rootedness in the land that shaped our rich Sikh history and heritage. There is a sense of love and inspiration that has been laid down by the Gurus that Sikhs can always look at as a model of how to live an inspired life. At the very least, we can live that way as much as we can. We can work on these issues so the next generation can work on them as well.